Lock in a great price for Hôtel Saint Nicolas – rated 8.9 by recent guests! Great location, fantastic breakfast, and extremely helpful front desk! Very friendly, helpful and hospitable! Room was very quiet, clean and cozy. Loved the shutters so much that we got up late! The location is great in the centre of La Rochelle's old town. The room 502 was modern and well equipped. The breakfast was good with a lot of variety. Our second visit. Comfortable, plenty of space in the room, friendly, wonderful breakfast. Perfect position. Would always stay there if visiting LaRochelle. Excellent location for exploring La Rochelle. My mother is disabled and they organised a walk in shower for her for when we arrived. She asked for a non slip shower mat which was promptly placed securely in the shower. Reception provided jugs of milk when asked, which was great. If you book parking, do make sure that you let the hotel know through booking assistant, confirming when they reply. Some people had not confirmed the booking assistance messages and subsequently were not allocated parking. The location and overall feel of the hotel was good. The reception staff were very helpful. But I felt housekeeping lacked somewhat. Location is good, accommodations are fine, and theme and air of hotel is very nice and appropriate for the locale. Great location to town, restaurants and the port. Cleanliness. I managed to get a vomiting bug on the trip there so my 2 nights there were a complete write off but the staff were fantastic! Centrally located hotel within walking distance to restaurants and the whole town. Excellent breakfast. Parking provided (for a fee) which was important as no parking nearby. One of our top picks in La Rochelle.Located in the lively Saint Nicolas district in La Rochelle, this hotel is surrounded by antique dealers, bars and cafés. It offers free Wi-Fi and a conservatory with large sofas and tropical plants. The air-conditioned guest rooms each have a flat-screen TV with canal+ and satellite channels. Private bathrooms are equipped with a shower and hairdryer. A buffet breakfast featuring hot and fresh items is served daily in the conservatory. A continental breakfast can also be delivered directly to guests’ rooms. Local drinks, tea and coffee can be enjoyed in the bar. Limited private secured parking can be booked at an extra cost, upon availability. Saint Nicolas Tower that guards the entrance to the old port is 1,800 feet from the hotel. La Rochelle Train Station is 2,300 feet away. This is our guests' favorite part of La Rochelle, according to independent reviews. This property also has one of the top-rated locations in La Rochelle! Guests are happier about it compared to other properties in the area. This property is also rated for the best value in La Rochelle! Guests are getting more for their money when compared to other properties in this city. 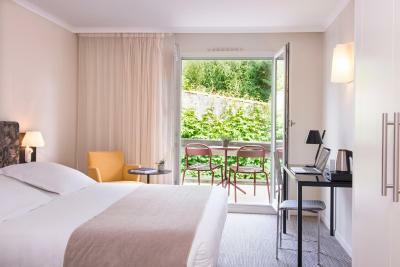 When would you like to stay at Hôtel Saint Nicolas? Air-conditioned room with free Wi-Fi and a flat-screen TV. This room has a private bathroom with free toiletries. This triple room has air conditioning and cable TV. This double room has a satellite TV, air conditioning and a balcony. This triple room features air conditioning, cable TV and a balcony. The fiercely independent and ancient seaport of La Rochelle is still guarded by stunning fairy-tale towers – perfect for a city locals call "belle et rebelle“ (beautiful and rebellious). House Rules Hôtel Saint Nicolas takes special requests – add in the next step! ANCV Chèques-Vacances Hôtel Saint Nicolas accepts these cards and reserves the right to temporarily hold an amount prior to arrival. Hôtel Saint Nicolas accepts these cards and reserves the right to temporarily hold an amount prior to arrival. Please note that car park access is limited to a height of 6.4 feet. Guests requiring a paid parking space are advised to reserve it by contacting the hotel using the details on the booking confirmation. Breakfast is free for less than 6 years old children and costs EUR 6 for children between 6 and 12 years old. Dogs must be on a leash anytime inside the property and are not allowed in the breakfast room. Please inform Hôtel Saint Nicolas of your expected arrival time in advance. You can use the Special Requests box when booking, or contact the property directly using the contact details in your confirmation. One of the most picturesque neighborhoods in La Rochelle! I found the receptionist who checked us in overly formal and condescending. The ‘standard room’ on the third floor was tiny with a sloping roof so very difficult to move around. Air conditioning was on ‘heat’ in April so it was very hot and we had to sleep with the window open so we’re disturbed by noise from the street. Would not recommend this hotel unless you pay more for a superior room. The lounge area downstairs was peaceful and comfortable. Parking was easily accessible at the back of the hotel. Personnel extremely polite & helpfull, excellent hotel condition, best location downtown, cosy rooms and very good breakfast!!. All family had the same opinion: Just excellent value for money!! Congrats to SaintN hotel. The location is superb and this hotel is a delight. The staff are very good. This is an ideal hotel for s short break. Excellent location, comfy beds and brilliant staff. Great position in centre of La Rochelle. Dog friendly and parking. Very friendly and helpful staff. The room was very clean, and breakfast also very good. Great location and excellent breakfast. Slightly difficult to find when driving. My tip is to ignore the Sat Nav (Wanted me to drive down the wrong way of the one way streets) just follow the local sign posts which are everywhere. Breakfast was plentiful, varied and tasty. Beds comfy. good shower. Local area is extremely pretty. Stayed for three nights for the rugby & couldn’t have picked a better hotel. Polite & friendly staff, convenient central location, clean and comfortable room. Also impressed that the windows completely block out any street noise, so no sleep distractions. Please add a small fridge. Please provide slippers. Location is excellent. Staff is polite. Took us a while to work out how to access the hotel and parking. A better explanation how to get to the hotel by car would have been helpful. Excellent location! Very close to the harbour, restaurants and shops. Hotel was very comfortable and despite being close to all amenities it was very quiet. Great to have parking!